Have you heard the news? Sunderland Museum & Winter Gardens is hosting 12 of Leonardo da Vinci's drawings in a special exhibition available from now until 6 May. Tickets are just £2.50 per adult (under 16s go free but still need a ticket) and should be pre-booked with a time-slot in advance online to avoid disappointment (the exhibition has sold out over the last two weekends). 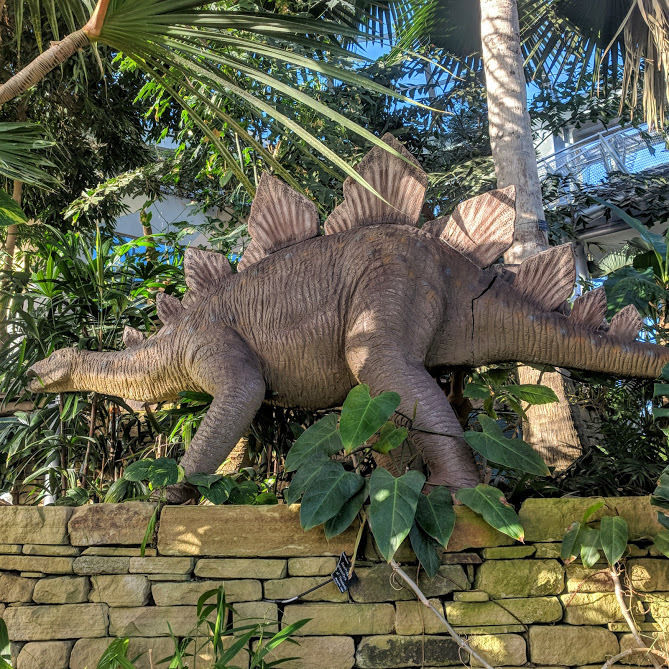 If you combine a trip to the exhibition with a chance to explore the rest of the museum and gardens, it's a fab low-cost day out for families (and all indoors too). 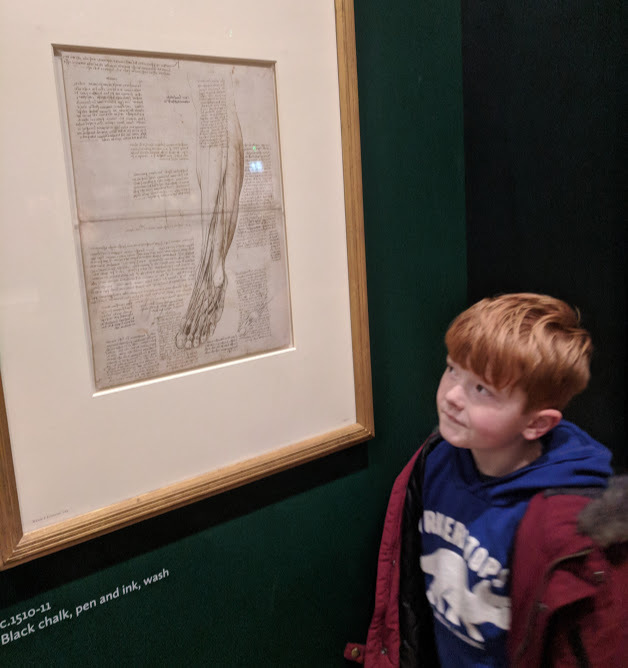 There's also a range of special events taking place over school holidays which have been designed to inspire children and hopefully show that Leonardo da Vinci's work is inclusive to all (scroll to the bottom of this post for a full list of half term events). We really enjoyed our visit and it was a cheap and interesting way to fill in half a day. This year marks the 500th anniversary of Leonardo da Vinci's death and to celebrate, 144 of the Renaissance master's greatest drawings from the Royal Collection are to be displayed in 12 simultaneous exhibitions across the UK. 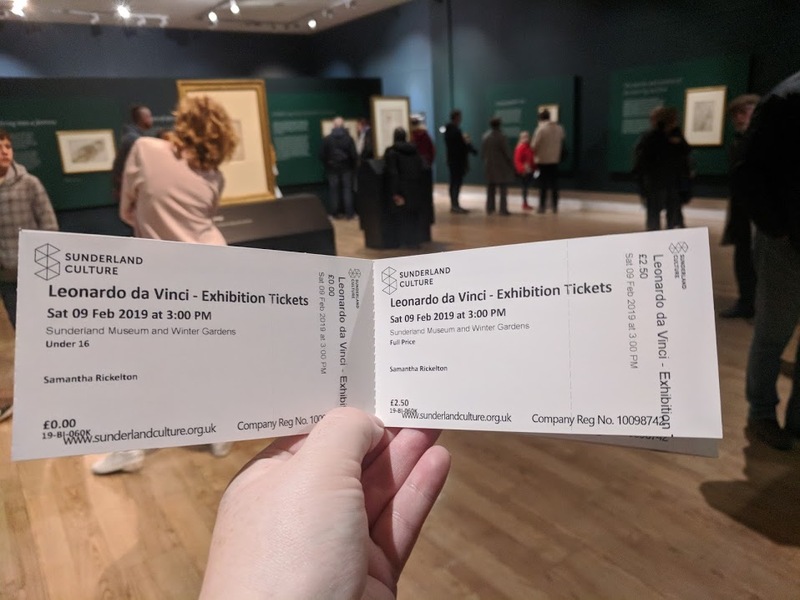 Sunderland Museum & Winter Gardens has been chosen as an exhibition host and with 12 drawings showcasing a range of Leonardo's interests from anatomy to geology and botany, it's the biggest ever showing of it's kind in the North East and the only opportunity to see his work between Leeds and Glasgow. The exhibition runs from 1 February - 6 May 2019. 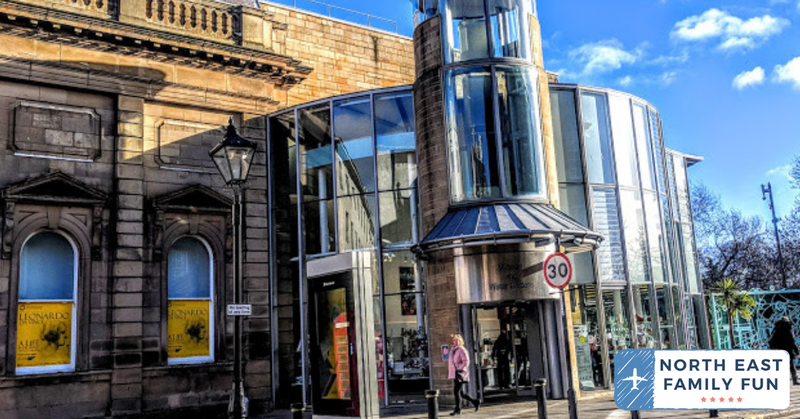 Entry to Sunderland Museum & Winter Gardens is FREE and admission to the exhibition is just £2.50 per adult (under 16s go free). Tickets and a time slot should be pre-booked online here. We parked in Mary's Place car park (our go-to parking spot in Sunderland) which was a short walk away. The Bridges Car Park is close by too and Sunderland Train and Metro stations are within easy reach of the museum. Days out with the kids can often be so expensive so I love it when I come across a bit of a bargain. 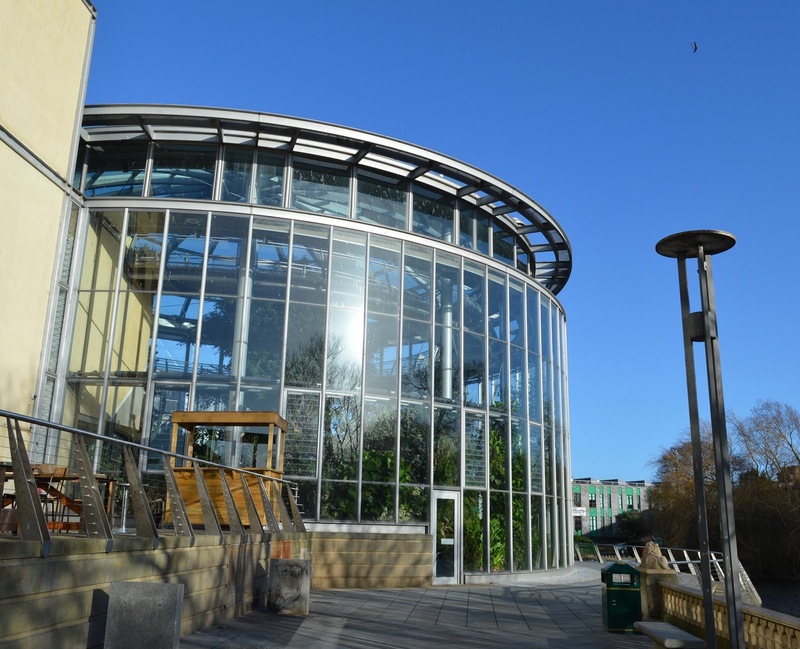 Sunderland Museum & Winter Gardens are FREE to visit and the exhibition is just £2.50 per adult and FREE for under 16s. There's a park across the lake if you wish to take a picnic and make a day of it. With the museum, gardens, park and exhibition you could easily fill in half a day for less than £5 per family. Steve and I have actually seen the Mona Lisa in Paris. I was underwhelmed if I'm honest and don't know what all of the fuss is about. We don't have any plans to take the kids to go and see it. I actually much preferred the drawings in Sunderland and you can get so much closer and see all of the fine details (whereas you're fighting to see over a sea of heads when you visit the Louvre). 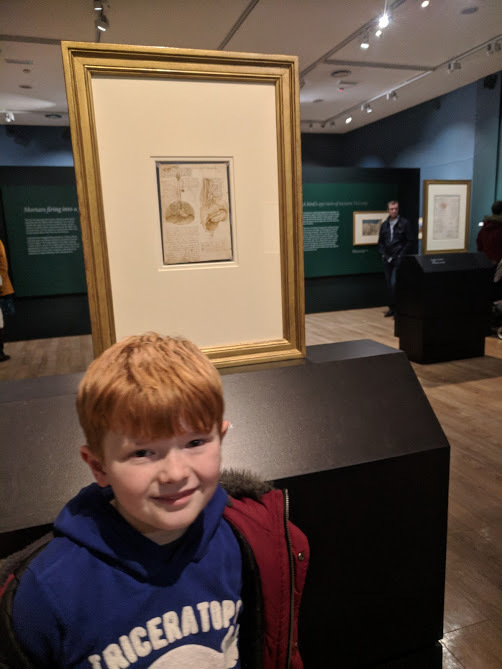 H, H and J know who Leonardo da Vinci is - they've learned about him at school and I am so pleased we have a unique opportunity to take our kids to see one of the greats right on our doorstep and without the crowds of the Louvre. 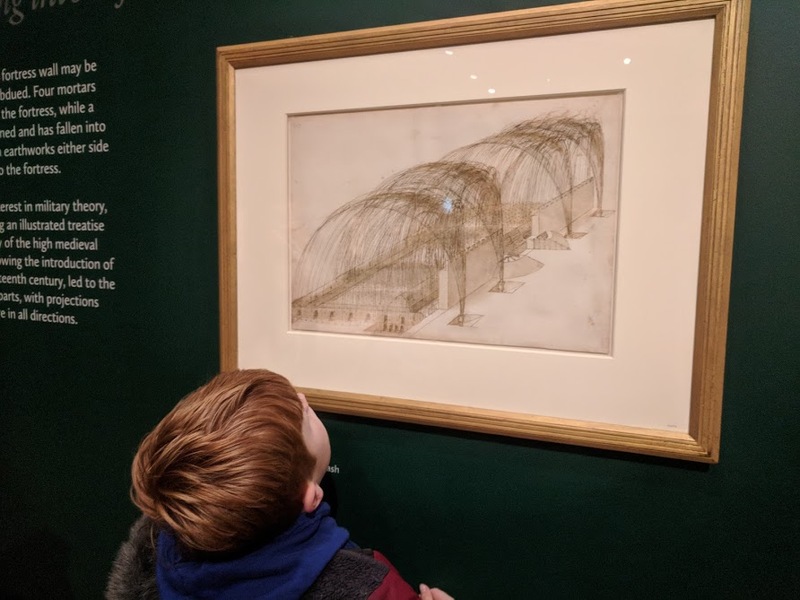 I always think you learn better through experience and I'm hoping that the kids will remember the intricate line drawings and mirror writing they've seen at the exhibition forever. As somebody who works in a creative industry but was told I should focus on an academic career when I was at school, it's really important to me that I raise H, H and J to be surrounded by lots of different options. 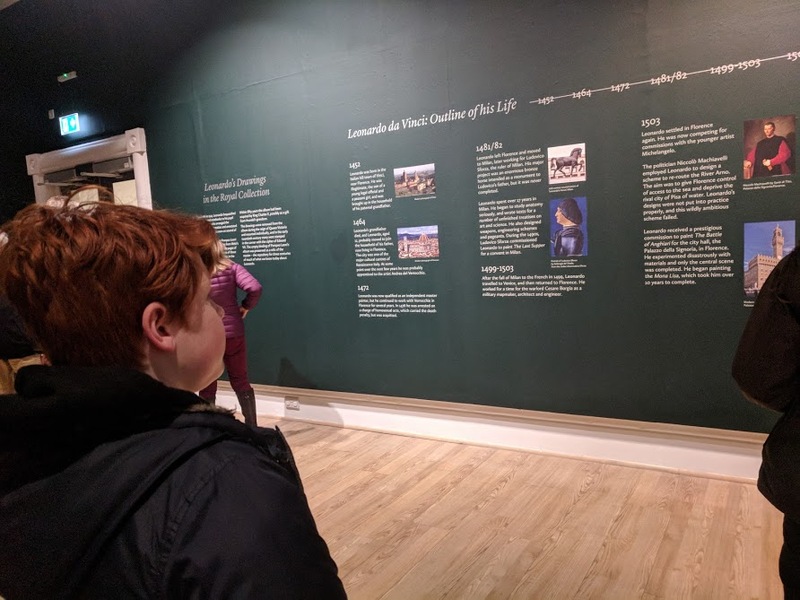 I don't want to put any boundaries on what they do with their lives and I really believe that opening up the world to them through visiting exhibitions like this will inspire them and show them how much they could achieve in life. This exhibition has not been designed specifically for children - it's for everyone. Don't expect to find child-friendly activities in the gallery (although there are plenty in the museum and gardens and special events). However, children are made to feel very welcome and will engage if you give them the chance. 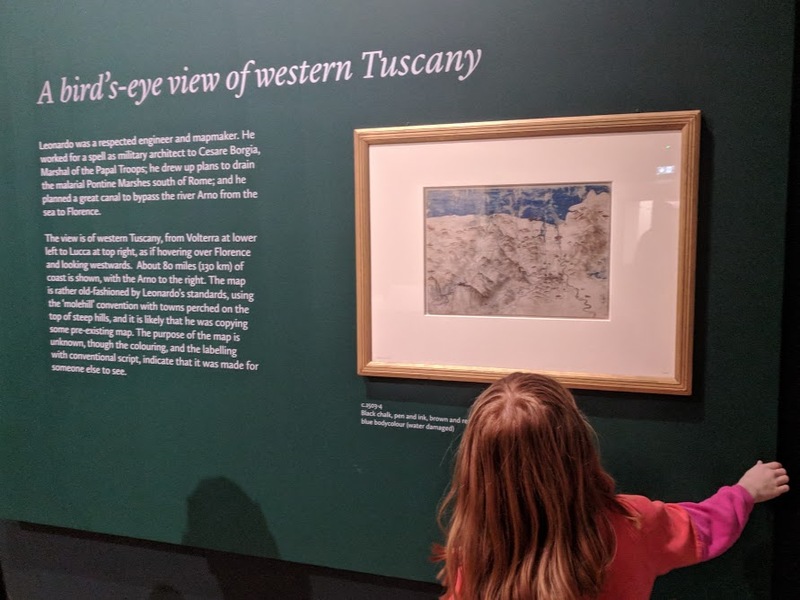 I always challenge the kids to find their favourite picture when we visit a gallery and continuously ask them questions about what we are looking at. 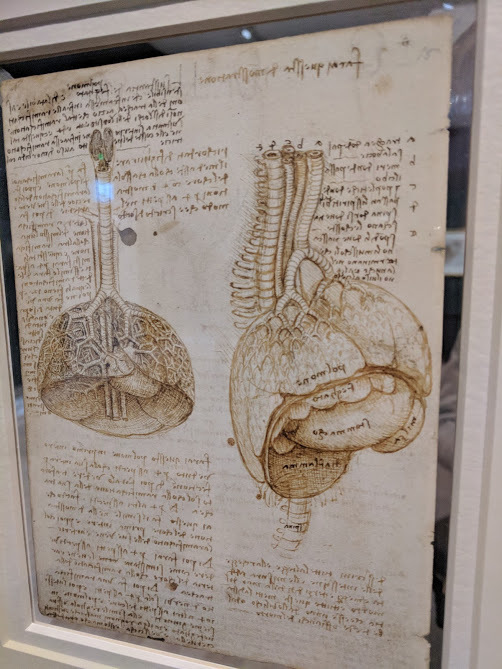 For us, the exhibition sparked lots of interesting debate including 'How did Leonardo know what the inside of a lung looked like?' (we found out he dissected over 30 bodies in his lifetime) and 'Do we think we could write like Leonardo?' (a resounding no). 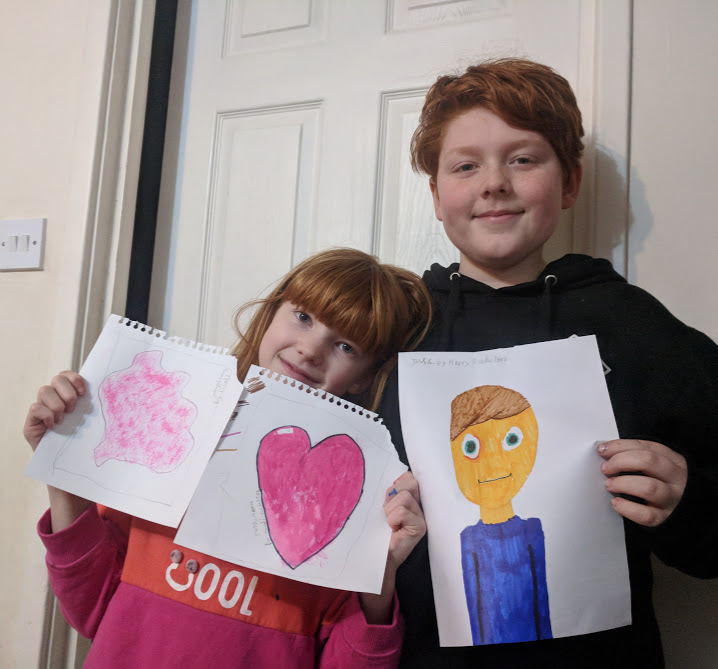 When we returned home with absolutely no input from me, Harry and Heidi created their own drawings which were inspired by the exhibition. I absolutely LOVE this! Harry created a self-portrait and Heidi went with 'Messy Heart by Heidi Rickelton' and 'A Map of France'. Then on Sunday, they cycled to The Works to buy new art supplies with their pocket money. It is obvious to me that they have been inspired by the portrait, anatomy and map drawings we saw at the exhibition. What do you think of their creations? They're no Leonardo but I'm proud all the same. The Leonardo da Vinci exhibition gave us a great excuse to visit the rest of Sunderland Winter Gardens - somewhere we'd never visited before but I'm pleased we finally got around to. The exhibition is located on the second floor but it's worth adding a little bit of time to explore the rest of the museum and gardens too. There's loads to see and do here including a museum over three/four levels sharing Sunderland's heritage - expect to learn about coal mining, shipbuilding, the glass industry and more. There's lots of hands-on fun and we particularly enjoyed comparing a typical family meal and how it's changed over the years. 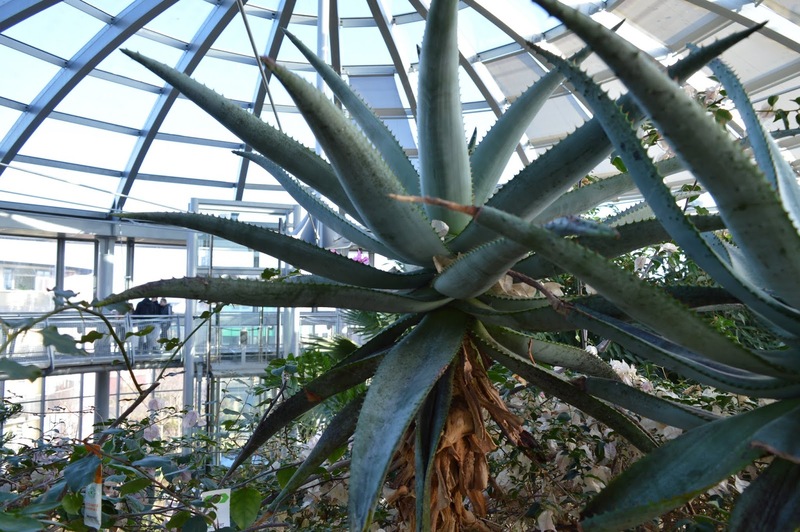 The Winter Gardens are pretty small but still worth a walk around. 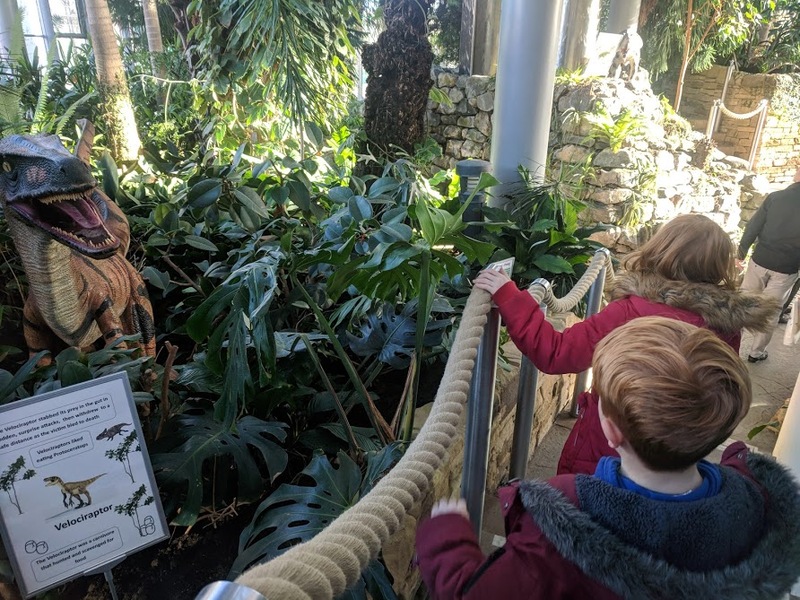 Jack and Heidi loved spotting the various dinosaurs hidden amongst the tropical rainforest and looking at the fish in the pond. You can climb up to the canopy too which offers fabulous views. 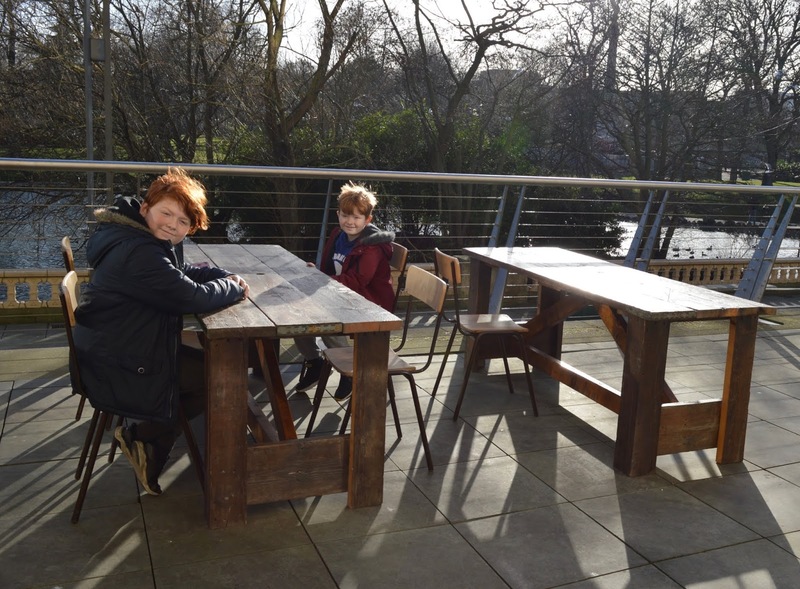 Refreshments can be found via Holmside Coffee - a lovely local coffee shop serving homemade food and Ouseburn coffee at decent prices. There's indoor and outdoor seating too. 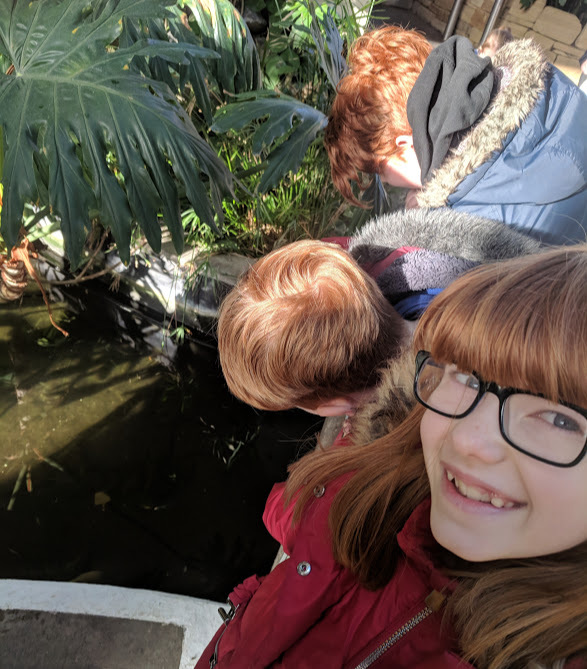 After spending 20 minutes inside the tropical winter gardens we opted to enjoy our drinks outside and loved the view of the swans and ducks on the lake below. Finally, there's a library and book corner plus a gift shop at the entrance and various trails taking place over the year. 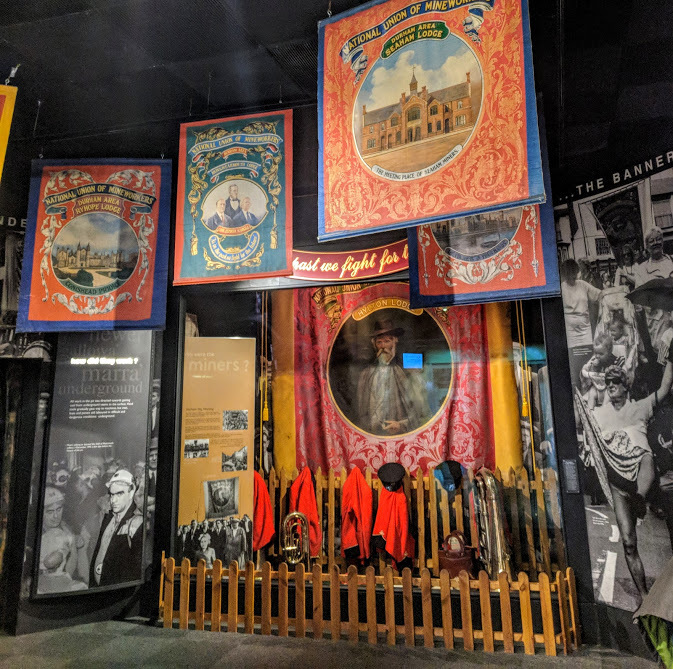 I love that there's a carefully curated range of events running alongside the exhibition which has been put together to encourage families to get involved and get more from the exhibition. There are lots to choose from including a catapult challenge, 3D modelling and science days. All are available at a low-cost and have been inspired by the exhibition. All events require adults to remain with their children and most are drop-in (I've mentioned and included a link to book if pre-booking is required). Leonardo code cracker trail - 16-24 February during museum opening hours. Follow a themed trail to crack the code and win a prize. Trails cost £2.50 each and are available at the visitor services desk. Find out more here. Bird's Eye Views - Monday 18 February 11am-12:30pm and 1:30pm-3pm. Make a giant map of Wearside inspired by Leonardo da Vinci's map of Italy. No need to book - just drop in. Suggested donation of £3. Find out more here. Body Sculptures - Wednesday 20 February 11am-12:30pm and 1:30pm-3pm. Construct 3D models of the human body inspired by Leonardo da Vinci's drawings. No need to book - just drop in. Suggested donation of £3. Find out more here. Portraits and Poses - Friday 21 February 11am-12:30pm and 1:30pm - 3pm. Dress up like a Renaissance character then draw your own portrait. No need to book - just drop in. Suggested donation of £3. Find out more here. Amazing Adventures Trail - 2 March - 6 May. Available during museum opening hours. Follow the special trail to discover amazing inventions made in Sunderland and beyond. Collect the answers to claim a prize. Trails cost £2.50 each from the museum shop. Find out more here. British Science Festival: Have fun with flight - Saturday 16 March 11am, 1pm and 2:30pm. Find out about Leonardo da Vinci's inventions and the science of flight in a fun family session led by Neil Harrison from Big Bang Science Parties. Learn about air resistance and forces through flying demonstrations and even make your own flying machines. Aimed at children aged 4+. Sessions must be pre-booked and cost £4 per child. Find out more and book online here. Illuminate Science Family Day - Saturday 6 April. Includes Physics Busking at 11am-12:30pm and 1:15pm-3pm. Join the Institutes of Physics for some light-hearted Physics Busking, experiments and hands-on fun. No need to book - just drop in. Suggested donation of £3. Find out more here. On the same day you can check out Fluorescent Painting workshops at 11am, 1:15pm and 2:15pm for your chance to discover how light works and watch your creations come to life under UV. Come dressed for mess! These sessions must be pre-booked and cost £3 per child. Find out more here. Little Inventors: Unleash your inner Leonardo - Monday 8 and Wednesday 10 April 11am-12:30pm and 1:30pm-3pm. If Leonardo was alive today, what inventions do you think he'd create? Draw and create your own inventions with the help of Little Inventors. No need to book - just drop in. Suggested donation of £3. Find out more here. Little Inventors: Makers Day - Friday 12 April 11am-12:30pm and 1:30pm-3pm. Create your own inventions and turn them into 3D models with Little Inventors. No need to book - just turn up. Suggested donation of £3. Find out more here. Horses, Horses, Horses - Monday 15 April 11am-12:30pm and 1:30pm - 3pm. Be inspired by Leonardo's love of drawing horses and create your own horse-themed masterpiece. Magical unicorns and winged horses are encouraged! No need to book - just turn up. Suggested donation of £3. Find out more here. Science Buddies Catapult Challenge - Wednesday 17 April 11am, 1pm and 2:30pm. Work in teams with the Science Buddies to design, create and test your own catapults. Sessions should be pre-booked, are suitable for ages 7+ and cost £4 per child. Find out more and book online here. Renaissance Medicine Family Day - Saturday 4 May 11am, 1pm and 2:30pm. Blood! Snot! Bile! Leeches! Learn all about the secrets of renaissance medicine from the experts and make your own protective charm to ward off the plague. Sessions are suitable for children aged 5+, cost £4 per child and should be booked in advance. Find out more and book online here. Even if art isn't your thing, I think a trip to see this exhibition is 100% worth it. There might not be another chance for us to see work by one of the greats in the North East again and it's such a bargain of a day out too. Let me know if you're planning on visiting. 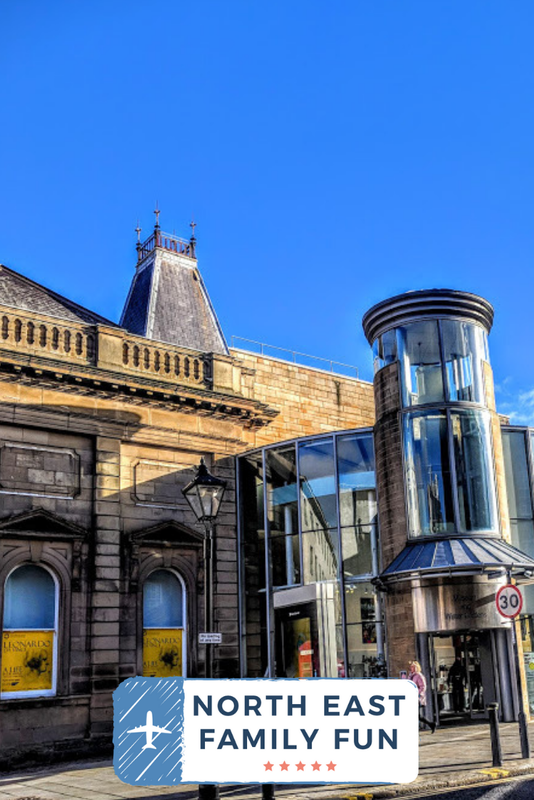 Find out more about Sunderland Museum & Winter Gardens here and book your tickets to the exhibition online here. I love the sound of this - it's so great to have this opportunity and a real bargain. Love how creative it encourages kids to be.